Mad Science parties are one to two hour parties for ages 4-11 held at YOUR location or OURS - all parties include a hands-on make and take item! 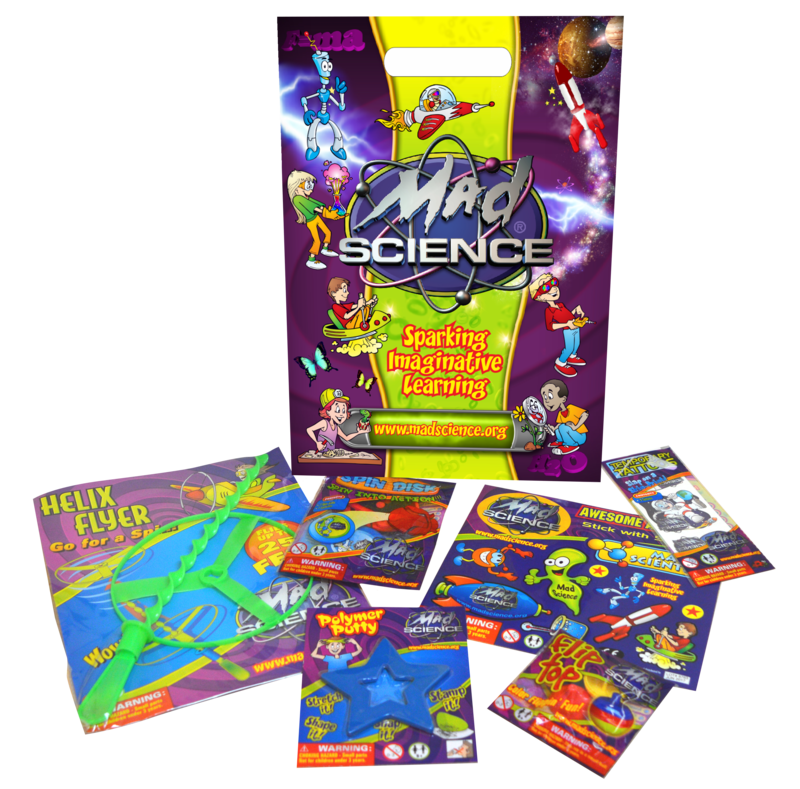 Mad Science has everything you need to make your child's party a success! Please note, pricing does not include gratuity. My home or other venue I have secured. I want to host my party at the Mad Science Lab. One hour of thrilling entertainment! Kids will enjoy a 45-minute show full of science excitement followed by 15 minutes making an awesome polymer creation. During the first 40-45 minutes, the Mad Scientist will engage children with amazing science demonstrations that are conducted with the help of your birthday child and guests. While we do not guarantee exact experiments, some examples of experiments that may be included are: fitting a hardboiled egg into an impossibly small space, seeing flash paper disappear, or watching a Mad Scientist turn juice to water using only their breath. You may stick with our super slippery slime or upgrade to our slime bling for some added amazement. For ages 7 and up you may also choose our super bouncy balls upgrade (Parties of up to 20 kids only). 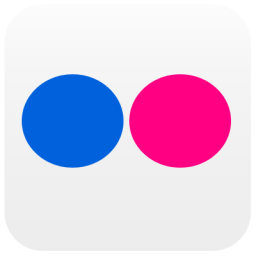 *16% Gratuity will automatically be added to invoices for parties with more than 30 children. Always very popular, children choose their color and stir liquids together to make “Slime”. This is an introduction to polymers (long strands of molecules linked together). Slime is 99% water—pull slowly and it stretches; pull quickly and the bonds break. Choose this as your one included take home item. Upgrade your slime experience for even more unique fun! Each child will get to choose one of the 6 different options below. Iridescent Slime - Iridescent glitter and confetti add a magical touch to your slime whether it's for a mermaid, princess, or unicorn. Dragon Scales - Metallic glitter in bright jewel tones will transform your clear slime into an adventurous potion guaranteed to satisfy any dragon tamer, wizard, or self rescuing princess. Crunchy Slime - Small styrofoam balls will make a sensory experience unlike any others. Mixed with our Mad Science slime it becomes frog eggs, ogre boogers, or just fun to touch. Polka Dots - Colorful mini pom-poms disperse through the mixture to create a polka dotted effect sure to delight everyone. Snowballs - A scoop of instant snow turns slime into a year round snow ball. Treasures - Flashy jewels will make a slimy treasure for your princess, pirate, or treasure hunter. Bling kits will also include various glitters* and coloring for the slime. *Glitter may be excluded upon request. Add this to your one included take home slime for $15 for up to 20 kids. Make super balls with this hands-on project! Kids add the polymer crystals to the mold and immerse in water for 3 minutes. Presto! The super ball is ready for some supercharged bouncing! Add this to your one included take home slime item for $30 for up to 40 kids. Dry ice is cold (-79 degrees Celsius) and cool! Observe it in solid form and sublimating. Observe it make metal sizzle, jump and rattle. Kids experience cool demonstrations like “The Big Burp”, potions that ooze gas clouds, a bubble shower of opaque carbon dioxide and a big fog cemetery movie effect. We LOVE this finale! The Skyblazer Rocket is a colorful and fun way to explore rocket science! After the countdown, your child will push the launch button to ignite the solid propellant engine which blasts the rocket high into the air; a parachute deploys and the rocket floats back to earth. The birthday child receives a new rocket kit to assemble as a souvenir. We will need an open outdoor space that is at least 20 sq ft. This is our most popular finale! We bring the Cotton Candy machine to your party and change the state of matter with “good taste”. Yes, science is all around us. Unlimited Cotton Candy is available to all in attendance for up to 15 minutes of cotton candy making after the Mad Science Show. It is shocking how much fun a Van de Graaff generator is! This is literally a hair raising experience when kids step up and touch the silver sphere with static electricity trapped inside, transporting the energy to the tips of each hair on their head. Each child will make their own Spin Art card to take home with them, including a frame. The Mad Scientist will explain why the paint makes the art that it does! 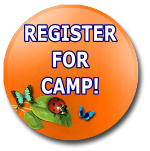 Kids will discover the sweet science behind one of their favorite things - candy! From the chromatography of Skittles® to the explosive powers of Mentos, we will satisfy the sweet tooth in young scientists. What does a marshmallow do in space? Can candy change states of matter? Find out in candy science. Please note: while we will examine the science behind many things sweet, these treats aren't meant for eating. Any food items meant for consumption should be provided by a parent. UNLESS you decide to add our Cotton Candy Finale - which comes with 15 minutes of unlimited cotton candy and makes a great addition to this party! You will automatically be upgraded to Marshmallow Fluff Slime! SLIPPERY SLIME: Always very popular, children choose their color and stir liquids together to make “Slime”. This is an introduction to polymers (long strands of molecules linked together). Slime is 99% water—pull slowly and it stretches; pull quickly and the bonds break. SLIPPERY SLIME with SLIME BLING! Each child will get to choose one of the 6 different options. Check out the take home list above for more info on this. MARSHMALLOW FLUFF SLIME: This shaving cream based slime has the consistency of a marshmallow smore! FLOAM SLIME: Tiny styrofoam balls transform regular slime into floam-y fun. 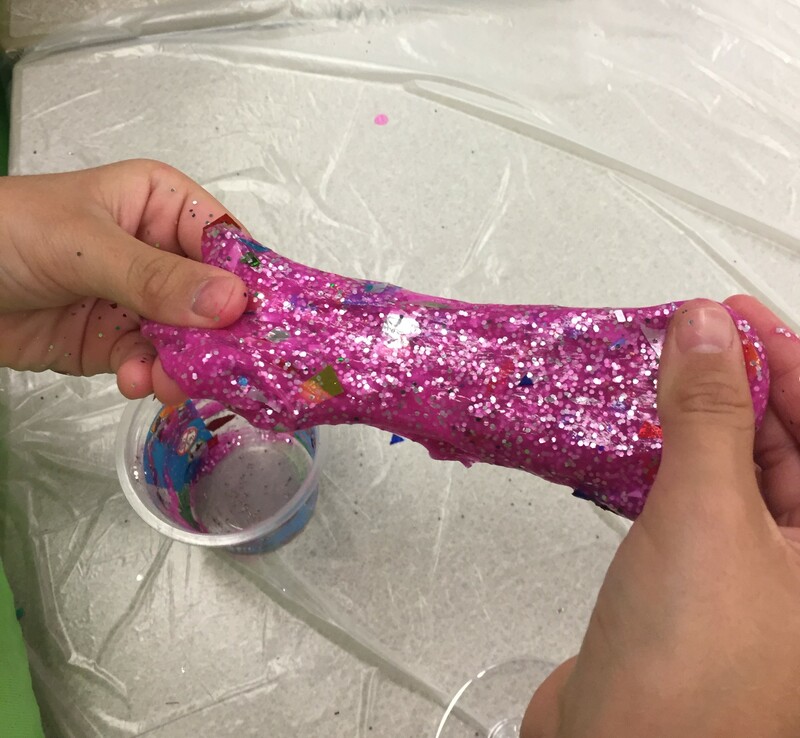 GLITTER SLIME: Using a clear glue base helps contain the shiny, shimmery, glitter ball. MAD PUTTY: Comparable to many DIY slimes, learn the proper method to make perfect white glue based slime every time. MAGIC MUD: This cornstarch based creation has amazing properties and teaches us about Non-Newtonian fluids. SNOWBALL SLIME: Sure snow is fun - but how about a perfect snowball? Mix slime and Insta-Snow to create a wintery wonder anytime of year. G-I-D SLIME: Start with our classic Slippery Slime, and add some glow in the dark paint to make glowing goo! CLOUD SLIME: Use a liquid starch based creation to make a slime that is fluffy, stretchy, and fun! We do not recommend or offer theme upgrades for parties over 20. Have you seen a party before? Don't worry, we have plenty of AWESOME experiments we can send that are DIFFERENT from previous parties as part of our Mad Lab Package! 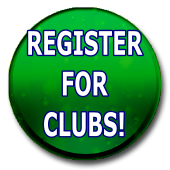 Just let us know so that we can send the BEST experiments for your group size and experience. Our most popular option for preschoolers! During this 60-minute program everybody gets to see, touch, and even help out with the experiments. 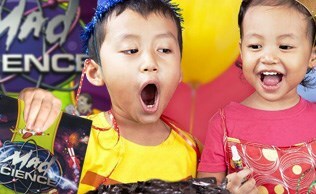 Your child will get to be our special birthday helper for some of the experiments. This party includes our bubbling potion finale. It's normally a $30 upgrade, but it's so much fun for the little guys that we include it at no extra cost for preschoolers. Every child will create their own Mad Putty to take home. A glue based polymer, children choose their colors and mix together to make a gooey cup of slime. Add Goody Bags to your package for $5 per. Purchase 10 or more and the birthday child's bag is free! Add Lab Coats to your package for $8 per. 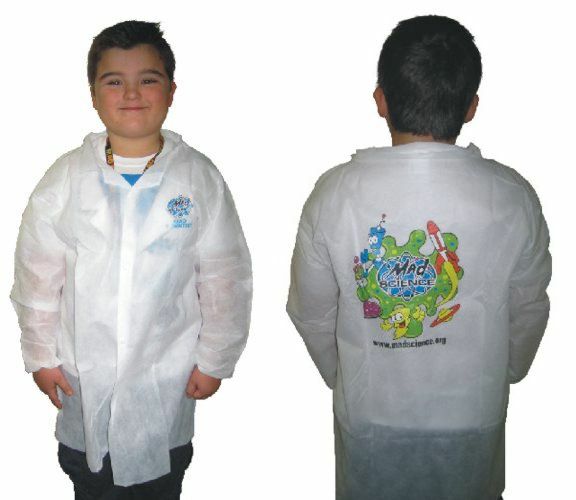 Have your child feel like a real "Mad Scientist" with their very own excellent quality, cotton Mad Science t-shirt. Add a T-Shirt for the birthday child for $8. 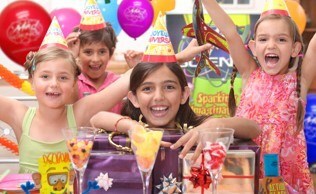 Purchase 10 or more for your party goers and the birthday child's shirt is free! Mad Science covers the Raleigh, Durham and Chapel Hill area.